Harbour Heights will be showcasing wines from the Family-run winery of Lupe-Cholet on Friday, January 21st 2011 at 7pm. Guest speaker, Francois Denis will be talking guests through the fine wines of Burgundy which will be served alongside a seven-course tasting menu compiled by Head Chef Norman Cook. 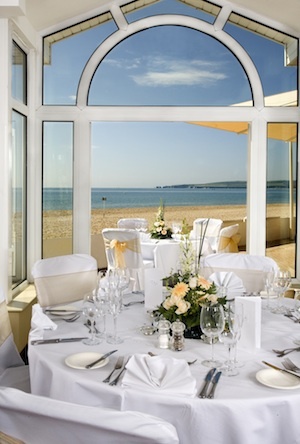 The FJB Hotels, comprising of The Sandbanks Hotel, The Harbour Heights Hotel, The Haven Hotel on the Sandbanks peninsular and the Chine Hotel in Bournemouth, are holding a wedding fair on Sunday 9th January form 10:00 to 16:00. Don’t miss the stunning and unique display of examples of wedding table settings, bridal suites and sample menus for the wedding breakfast as well as recommended suppliers in all the hotels to help with all those arrangements for this special day. BUT even more, the FJB Hotels are also having a competition to win a wedding at the FJB Hotel of your choice during this day only. All you have to do is answer four questions, one on each hotel, and if you get them right you will be entered into this draw to win a fantastic £1000 wedding package. Everyone that visits the Fair will be given the questions, full details of the prize and what it contains etc so don’t miss this great opportunity.